death – Creo en Dios! 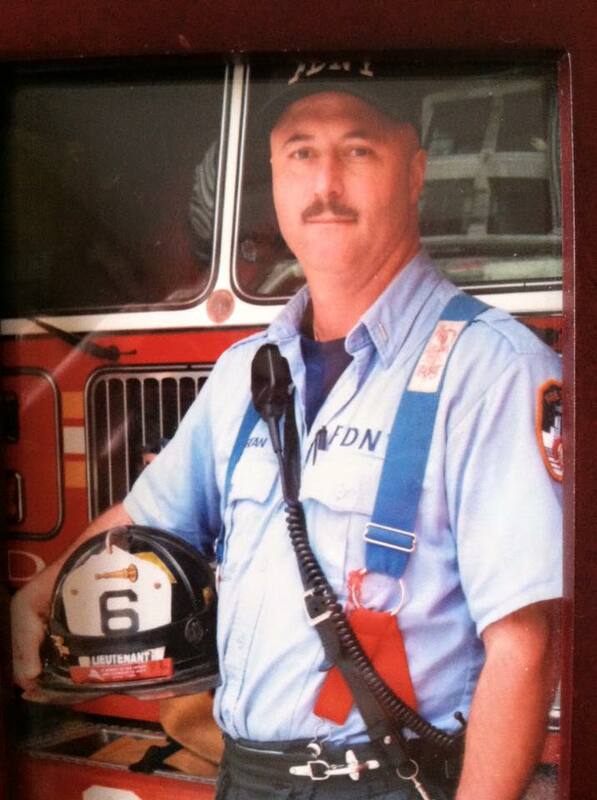 Today is the seventh anniversary of the death of my cousin Bobby, who was a firefighter. He lost his life fighting a house fire. It wasn’t the kind of fire that usually takes lives, but this one did. A ceiling collapsed on my cousin, knocking off his mask and air supply as he battled the fire from the second floor of the house. On an earlier anniversary of his death, I shared a journal entry Bobby wrote when he was in eighth grade titled Life and Death! As we move from the end of one liturgical year to the next, having been listening to the “end time” readings the last few weeks, I thought it worth sharing again. Isn’t that how most of us live our lives? At one level, we know we can die any time, but we live our lives with an expectation that we can plan for things that will happen next year….when we retire…when our children have children, etc. We don’t plan on dying – and we certainly do not plan on dying young. Bobby went on to say talk about how he hoped to live to be 80 or 85 because “life is the most precious gift God ever made, and it should not be taken advantage of.” He also (breaking my heart) expressed his hope that he would “die in [his] sleep, because it is painless and peaceful.” I’d like to think Bobby’s death was painless, but it is hard for to me to imagine that possibility given the circumstances. In any event, it certainly wasn’t peaceful. But even then, Bobby realized that his hope was only just that – a hope. He went on to acknowledge “I can’t control when or how I die.” An important realization, but one we have trouble acknowledging. There is one other thing too, I am not afraid to die. The words of an 8th grader. How deep was his theological understanding of resurrection of the dead when he wrote those lines? I don’t know. But I hope as he grew he continued to know that the God who gifted him with life would also be there holding him when he died. “I am not afraid to die.” May we all have the security of God’s boundless and eternal love, the security that allows us to face death without fear. Today is the twentieth anniversary of the April 19, 1995 bombing of the Alfred P. Murrah Federal Building in downtown Oklahoma City. One hundred sixty-eight people lost their lives that day, in what was, until 9/11, the deadliest terrorist act in the United States. One one of my visits to the home of my friends Michael and Maria Scaperlanda, they took me to visit the memorial of the bombing. 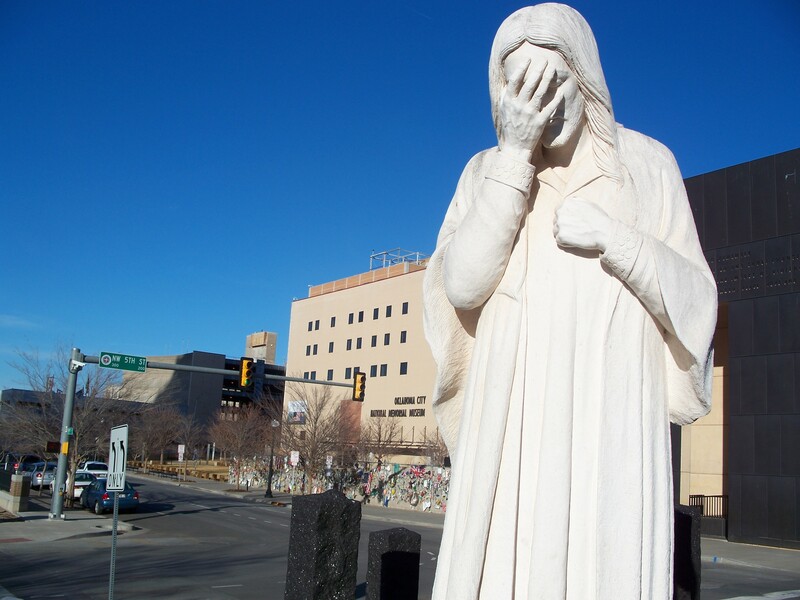 Here is the statue that stands across the street from the memorial entrance (which you can see in the background). 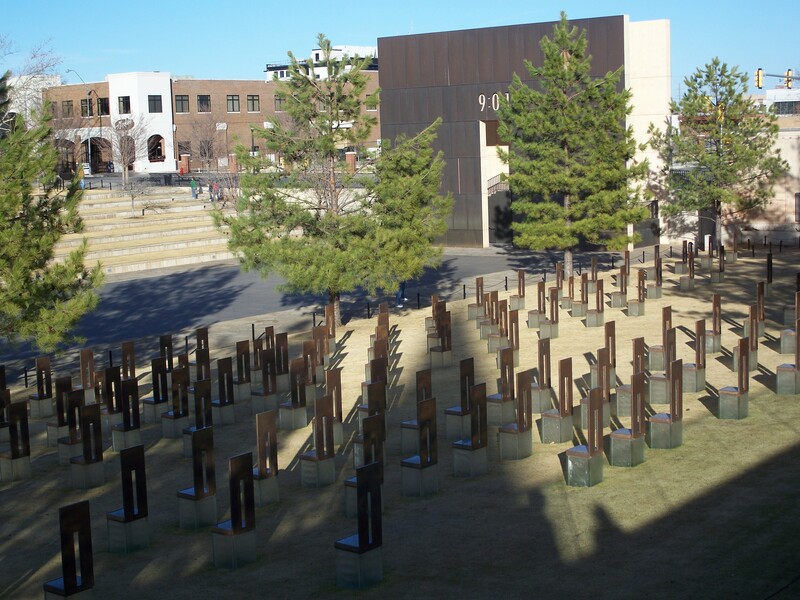 Part of the memorial is the Field of Empty Chairs, on which is placed one chair for each person killed, in the approximate position of where the person would have been in the building at the time of the bombing. Large chairs for the adults and smaller ones for the children. As we pray for the victims of terrorist acts….and for those who commit them, there is one other thing we should keep in mind, and that is what we celebrate during this Easter season: that death is not the end. Although I didn’t take a pictures of it, there is something else on that memorial site I have never forgotten: an American Elm called the Survivor Tree. The tree withstood the full force of the attack that day and there is no earthly reason it is not completely dead and gone. Yet it continues to stand and to grow. I felt its life and its power when I stood touching it during my visit to the site. You can literally feel the life pulsing through it. Here is the reflection my friend Maria Scaperlanda wrote for the fifteenth anniversary of the bombing. It is worth reading again today. Today is the 11th anniversary of my father’s death. It is hard to believe it is that many years. Sometimes it seems like yesterday, especially during those times when the feelings of loss rise so powerfully. The prompts are varied: I listen to my daughter’s recital and think how much my father would have enjoyed hearing her…I am invited to give a talk somewhere and think of how proud he would have been at it…We celebrate a family event together and I miss his laughter – or his sarcasm. This November will be the first wedding of one of his granchildren and I know the pain of loss will arise fiercely then. I’ve talked about death before. The only real solace is my conviction of resurrection. But that conviction doesn’t take away my missing my dad. When I pray that prayer, it is difficult for me to get the words out. When I pray that prayer, I half shake my head, especially at that last line because there are times I’d give just about anything to have some more time with my father. But I know I can’t ask that. So I pray, let me grown in my acceptance so that I am able to pray those lines more honestly and fully, to more and more bow to God’s most holy will. Still, I miss my dad. We’ve been seeing a stream of commentary over the last day or so about the death of Robin Williams, an actor beloved by so many people. I was shocked and saddened when I heard the news. Death always saddens us, and particularly so when someone takes his own life. I think that for those of us who do not suffer from deep depression, it is inexplicable that someone would feel so bereft as to take his/her own life. Yesterday morning, I learned that my dear friend John Palenberg had died the Monday evening. In October (while I was on Camino), John had emergency surgery to remove a brain tumor; the diagnosis was glioblastoma – one of those things that rarely, if ever, comes with a good prognosis. I am heartbroken, as are all of John’s many friends. (Also still a bit in shock; none of us expected the disease to progress quite this quickly.) I have shed many tears in the last twenth-four hours and doubtless will shed many more. John was one of the kindest, gentlest, funniest, amazing people in the world, and was a wonderful husband and father to his wife and two children. (He was also an incredibly intelligent and phenomenal lawyer.) He will be sorely missed. John was a man of deep Christian faith. He and I spoke on the phone a few weeks ago about our confidence in the Resurrection. He told me he had no fear of death, because he knew death is not the end of life. I thought of that conversation John and I had when I came across this piece yesterday written by Henry Scott Holland (1847-1918; canon of St. Paul’s Cathedral). I think John might have written something similar. John: Rest in peace, my dear friend. My life is the richer – and always will be – because of your presence in it. Love, S.J. On the drive to Appleton yesterday, one of the things Elena and I listened to was Jesus Christ Superstar. We both know the lyrics to the entire show (I was in a performance of it in high school and Elena – well, Elena seems to know the lyrics to everything). And we enjoyed singing our way across Wisconsin. Seems a bit strange at first blush – to get past death, you just have to die. The first thing the line brings to my mind is Jesus’ image of the grain of wheat. In John’s Gospel, Jesus tells his disciples that unless a grain of wheat falls to the ground, it will never be more than a single grain; it will not bear fruit. But if it falls to the ground and dies, it produces a rich harvest. At one level, Jesus was presaging his own death. And certainly Jesus’ death is an example of a death that conquered death, that gave rise to new life. But each of us must also die to conquer death. The more we try to protect our small egoic self, the more vulnerable we are to death. When we die to self, however, we truly live in Christ.